It’s Friday and time for another Art Feature. What medium do you use and why? First I started with graphite – like many artists, but then I fell in love with watercolor. I recently discovered the magic of digital painting. I sometimes use acrylic in my paintings with watercolor style. What inspires you? I’m mostly inspired from my flashbacks and clairvoyance. I know it looks little crazy but I see visions – like dreaming while awake. These visions are out of world style and differently textured. I like to paint them but sometimes my skill point is not enough to paint them – so I note them to paint later. I nearly have 100 ideas/visions to paint. Who are your favorite artists? Josephine Wall is my all time favorite artist but I love all artists who inspired and inspire with his/her style. For me it is important to reflect something, not copying an image. You are, not only a painter, but a very talented jewelry designer. How did you learn to make jewelry? My mother is also a designer and when I was a child, we spend most of our times with crafting. I just imagine the thing and then search for information to how to make them. I see you sell ACEOs. Would you tell us a little bit about them, for those who don’t know what they are? 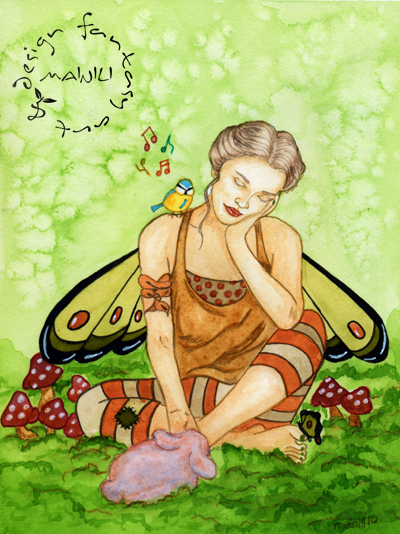 ACEO is Artist Cart Editions and Originals. They are fixed size, 2,5×3,5” art cards for limited editions or originals. 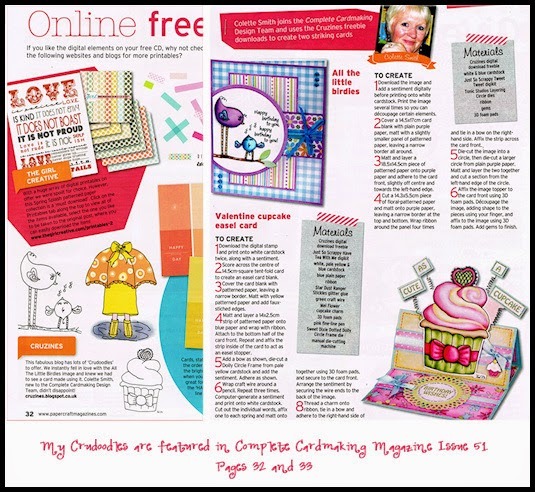 Whatever it is; photograph, scrap, painting or print, if it is 2,5×3,5” size then it is an ACEO. 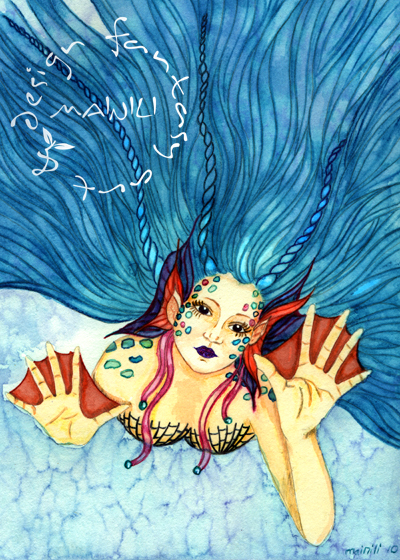 My ACEOs are from my watercolor fairies, mermaids and mushrooms…my ACEO prints are limited to 100 and I also print year, number, name behind the card. I also have many ACEO originals are available at my online shop. When you are not painting or making jewelry, what is your favorite pastime? FRP and RPG ! I love and love and love computer games ! I lost time and reality with this game world I play. It is a recharging and inspiring. My favorite games are Ice Wind Dale, Neverwinter Nights, Age of Conan, Drakensang, I may write many more. My favorite jewelry is my metallic friendship bracelets. They are unique with their metallic style. I also love my mushroom necklaces. What advice would you give aspiring artists? Believe and love ! Even I am not very experienced artist I am always open to questions. 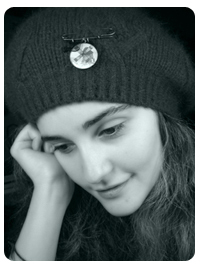 Want to see more of Mainili’s art and jewelry? Thank you Mainili for taking the time to do this interview. I’ve enjoyed seeing your art and jewelry and getting to know you. Drop by every Friday to meet more fabulous artists. Next week, I’ll be featuring artist, Maigan Lynn. 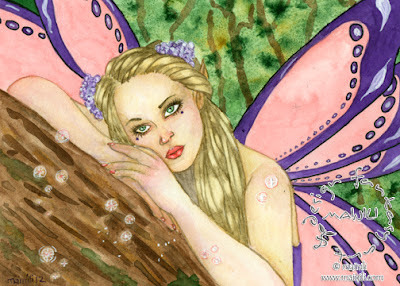 Posted in artist feature, Friday Art Feature and tagged ACEO, art, artist, artwork, fae, fairies, fairy, fantasy, inspiration, jeweler, jewelery, Mainili. ← USA National Doodle Day – Today! What beautiful jewelry! The metal friendship bracelets are very unique and original. I am a fan !